All of a sudden I am into big honking bracelets. It's not that I didn't appreciate them before. It's just that lately they've been consistently accenting my day-to-day outfits. 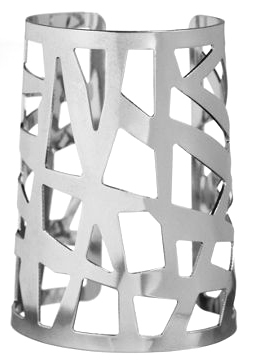 And I fell for another one yesterday, when at an LA showroom to preview Express' newest wares, I came across this geometric, artsy cool silver cuff. (BTW: I learned that the brand recently hired a new accessories designer, and I have to say, it showed!) I am telling you: this cuff has the power to turn heads. And it's glued to my wrist--for now. I have always loved big bracelets, cuff or otherwise. But I will only buy sterling. A bit pricier, but worth it. I hate plated / cheap jewelry that doesn't last. Quite like the geo design of the express one though! It is pretty. Take a look at these... they are pricier but stunning.